N.M. Thorn currently lives in South Florida with her husband and son. Owner of a digital marketing agency by day and a writer by night, she loves spending her times creating new worlds, paranormal planes of existence and anything that could be described as supernatural. When she is not busy working with everything digital or exploring fantasy worlds, she enjoys spending time with her family, reading, painting and martial arts. 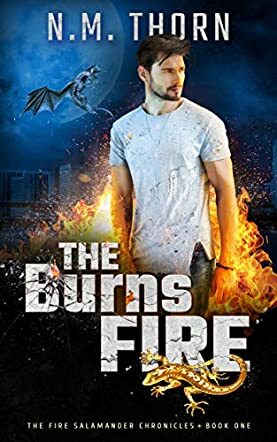 The Burns Fire is an action-packed work of supernatural urban fantasy penned by author N. M. Thorn, and is the opening book of the Fire Salamander Chronicles series. The plot centers around action hero Zane Burns, employed by the FBI in a secret division because of his special supernatural abilities. As a Fire Salamander, Zane – known as Gunz – knows his way around destructive magical forces, so when he’s assigned to an unusual homicide case, it doesn’t take him long to sense that something much darker is at play. The human and magical worlds collide as Gunz forces his powers to their limits to survive the can of worms that he has opened. Author N. M. Thorn does an excellent job of maintaining suspense from chapter to chapter, making the reading experience exciting and fast even though it is a lengthy book for its genre. I particularly enjoyed the cinematic quality of the action sequences and even the way the crime scenes and investigative moments were laid out: it felt like I was reading a really excellent police TV show. On top of this is the supernatural element of the salamanders, which was intriguing and unique, not something I’ve read before. Thorn’s concept for the powers that Gunz possesses was clearly defined, so when he builds and grows his skills it’s very logical and exciting to see. Overall, I would definitely recommend The Burns Fire for fans of both crime fiction and supernatural fantasy as it’s an action-packed read with solid magical concepts.